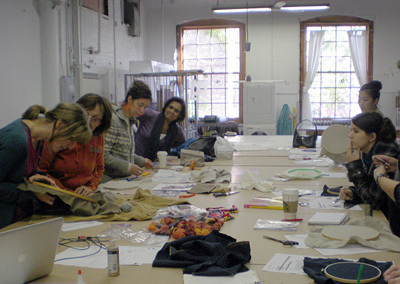 Participants were introduced to the burgeoning area of electroconductive textiles and explored the creative embellishment possibilities with conductive threads and the LilyPad. Images and videos of examples of both art and fashion that incorporate conductive materials were shown. Jennifer Hambleton demonstratd the LilyPad platform and taught the basics of circuitry necessary for creating conductive textiles. There was a discussion of further applications of the Lilypad technology to various textiles. Students had the opportunity to create a number of samples.